Cook meat in boiling water until almost cooked, drain. In another saucepan, submerge in this sauce, cook for an hour. 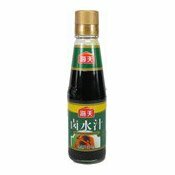 Ingredients: Water, Soya Sauce (Water, Soya Bean, Wheat, Salt), Sugar, Vinegar, Flavour Enhancers (E621, E635), Spice, Preservative (E211). Simply enter your details below and we will send you an e-mail when “Sauce for Pot-Stewed Food (鹵水汁)” is back in stock!